A scarf with 16 embedded RGB LEDs, individually controllable with a mobile device via Bluetooth LE (Low Energy). The electronics are invisible when turned off, and subtle yet present when on. The scarf is an actual wearable — in the sense that it can be worn at anytime because, when off, it is still a very wearable scarf. I am fascinated by projects that expose emotions — that remove a person’s ability to control/manipulate the external perspective of their internal emotional state. 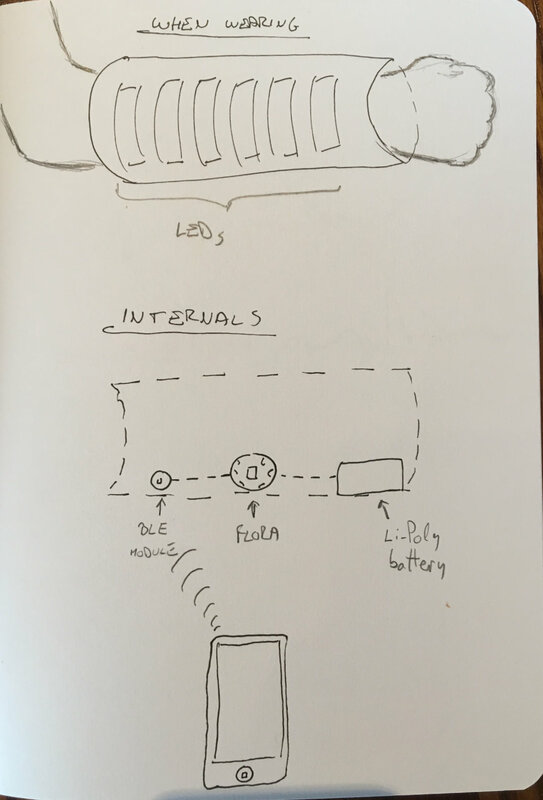 My initial idea was to create a wearable sleeve that would show the wearer’s heartbeat, or galvanic skin response values, in a way that cannot be controlled by the wearer. 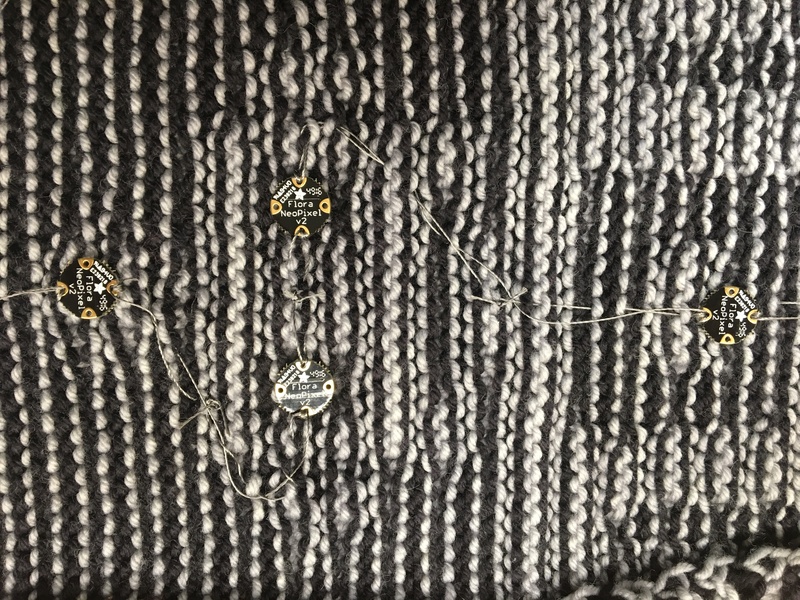 However I decided that my primary concern was making a wearable that is actually worn, so any wearable that would not be normally utilised by a person is less interesting. I also decided to step away from FitBit territory, since there are so many devices out there made specifically to measure the wearer’s vital signs. 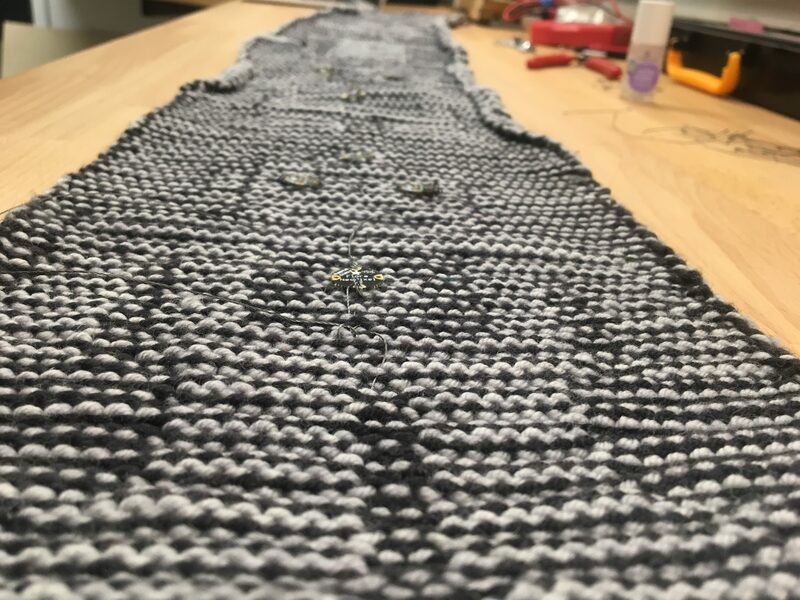 I chose the scarf because of two reasons: 1) it is a great wearable that can hide lots of electronics while keeping its function, and 2) a very good friend of mine (THANK YOU DANNA) was illusion-knitting a scarf that was 80% finished and was perfect for this project. For the interaction, I decided to explore Bluetooth. In hindsight, I probably would have chosen a different protocol of choice if I knew from the start how intricate and complex Bluetooth can be. Luckily, Adafruit (the providers of most of my electronics for this project) have also developed an app that makes Bluetooth easy and fun. 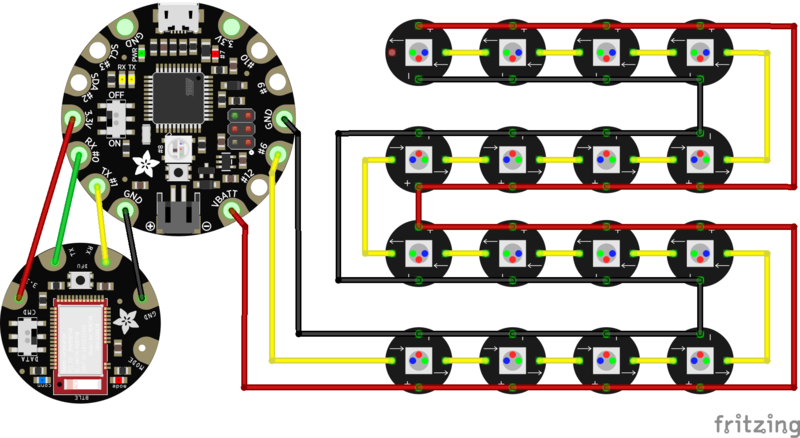 I would have wanted to able to do more with the connectivity, such as IFTT integration, but the UART/MQTT combo was too big of a boulder to cross in the timeframe I had (but see Further Development below). I wanted Bluetooth mostly because I didn’t want the wearable itself to have to connect to wifi. Using Bluetooth meant that the wearable can connect to a mobile device and work anywhere even without internet connectivity. By far the most time-consuming part of this project was sewing. 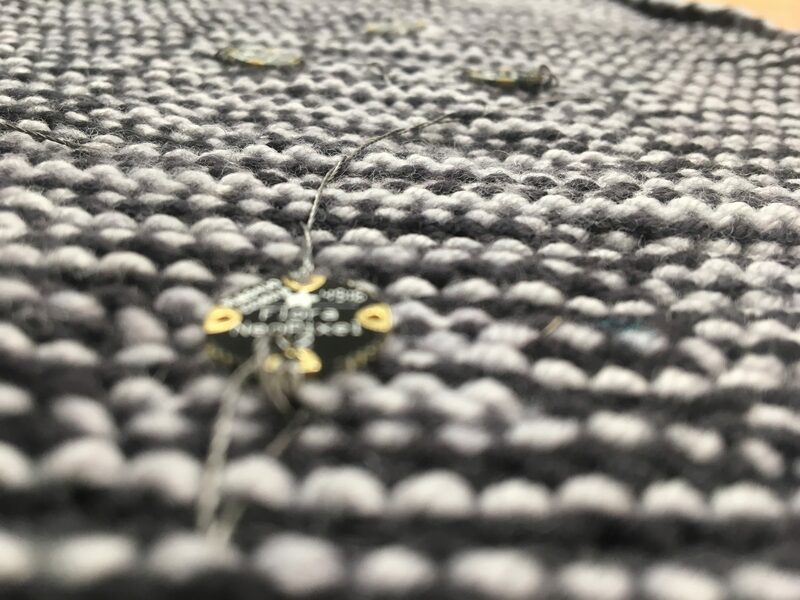 Working with conductive thread can be extremely fiddly — the thread is springy, thick, and tends to knot in spirals. 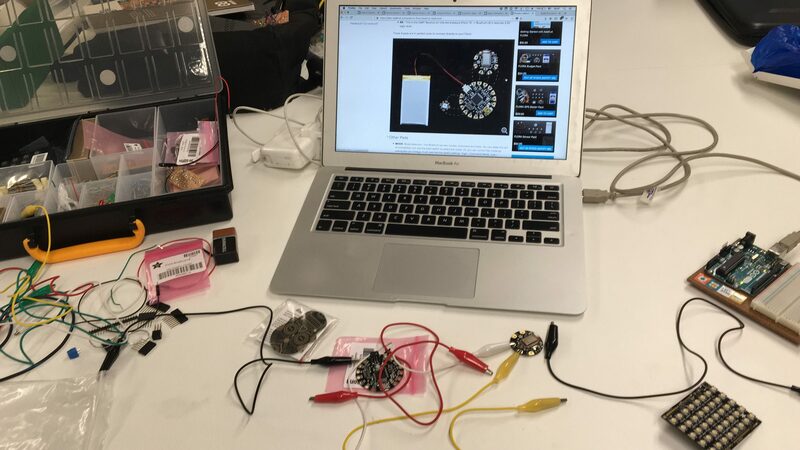 It also doesn’t make solid connections — once I connected all my component to the inside of the scarf, I went back in with a soldering gun and soldered each of the 80 connections between the Neopixels, the Flora and the BLE chip. I am not a fan of the cyborg-aesthetic, so I spent lots of time making sure the end result is as subtle and “normal” as possible. The scarf can be (reasonably) squished, tied, wrapped around the neck etc. The battery life is amazing (thanks to Bluetooth LE), all the sewn-in components are washable. 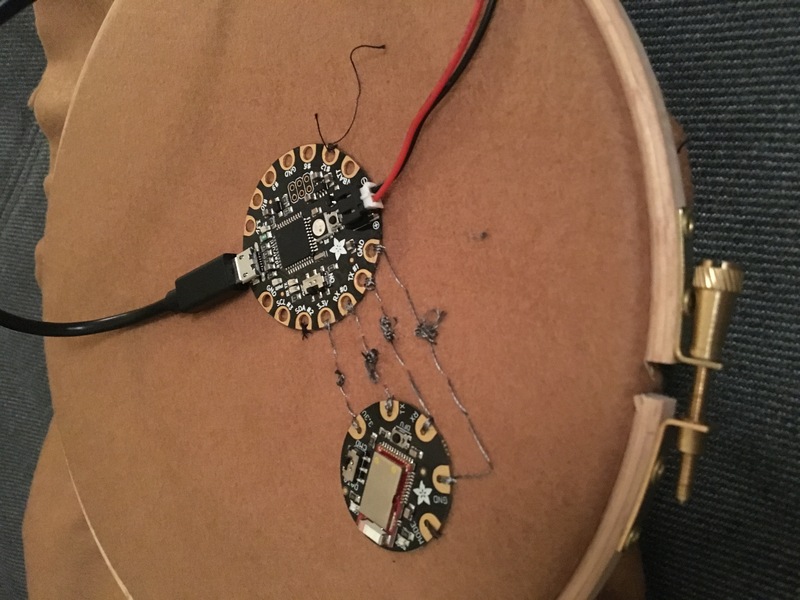 The microcontroller (Adafruit Flora), BLE chip and LiPo battery live in a velcro pocket so they can be easily removed or replaced. To come back to the idea of exposing emotions — I want the scarf’s lights to be controlled by external input, such as social media data or events. 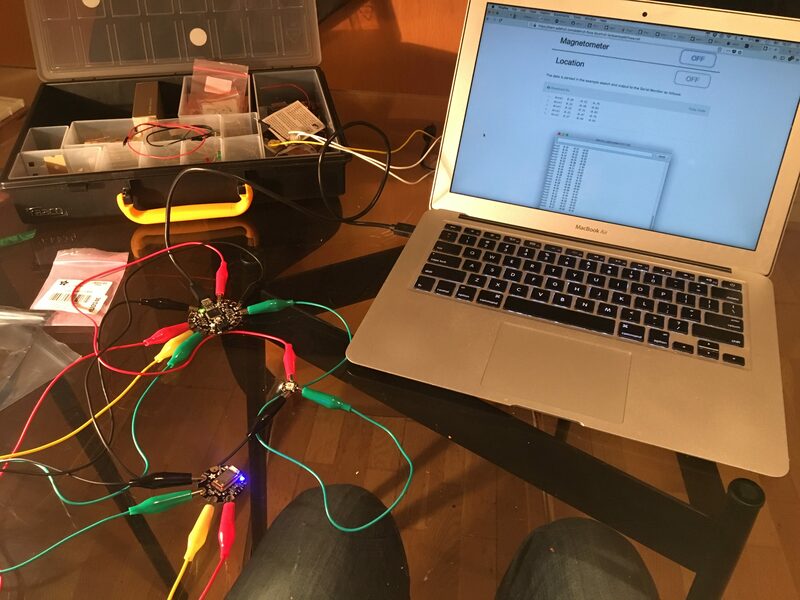 I have a working prototype that pushes Twitter data onto the mobile app via IFTT and Adafruit.io — the next step is figuring out how to make that information interact with the lights on the wearable.